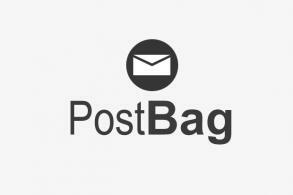 Cases of the sudden disappearance of political dissidents continue to mount. 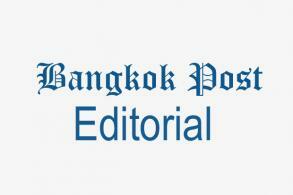 The latest such case occurred in daytime, inside a well-known Bangkok mall. Truong Duy Nhat, a well-known journalist and blogger in Vietnam, was seized and dragged out of Future Park shopping centre. He had just registered his personal details and applied for asylum through the UN refugee office. His disappearance on Jan 26 has received the usual silence from governments involved. Eyewitnesses to Mr Nhat's abduction have been found and interviewed -- but not by Thai authorities or by Vietnamese diplomats charged with protection of their citizens. The only Thai official to have shown any concern is the high-profile chief of the Police Immigration Bureau, Pol Lt Gen Surachate "Big Joke" Hakparn. His unacceptable response came last week. He said he can find no proof that Mr Nhat ever entered Thailand but he will try to investigate reports of his disappearance. At least it was admission thatauthorities had taken note of what is almost certainly hostile violence by foreigners on Thai territory. 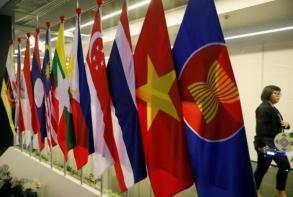 Officials claim even more ignorance of a disappearance of a political dissident linked to China. Book publisher Gui Minhai, a citizen of both Sweden and China, was caught on CCTV as he was abducted by a man as Mr Gui left his Pattaya apartment in October 2015. He later surfaced after months in Chinese police custody. Chinese and Thai officials supposedly responsible for law enforcement have stated they have no idea what happened. The government has the duty to protect foreign visitors, and investigate and reveal details of violence to any of them. 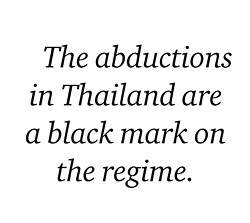 The abductions in Thailand of Vietnamese and Chinese who upset their governments are a black mark on the regime. But there is another side of the coin. Last week details emerged from friends and witnesses of the 2016 disappearance in Laos of Ittipon Sukpaen, aka DJ Sunho. Sunho's abduction -- friends and family are certain he was killed -- bringing to five the number of Thai citizens known to have been forcibly abducted from their homes in Laos and disappeared by "men in black". All five were fugitives from the military regime, facing charges that involved no violence, such as lese majeste or sedition. All government departments -- police, Ministry of Foreign Affairs, the Internal Security Operations Command (Isoc) -- claim ignorance. Their self-alleged lack of knowledge of all five violent disappearances is matched by an absolute lack of interest in what happened to Thai citizens abroad. It must be hoped that the abduction of Mr Nhat in Bangkok will bring a more acceptable response from government and security officers. 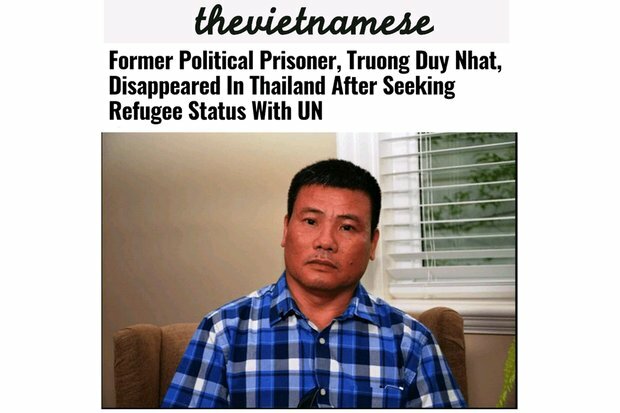 Mr Nhat was clearly a victim of an increasingly intolerant and violent Vietnamese regime. Scores of journalists and internet posters have been tossed into prison for articles and broadcasts that merely criticise Hanoi or local government actions. The regime of Prime Minister Prayut Chan-o-cha has refused to allow passage of a law to criminalise both torture and state-sponsored disappearances. Inside Thailand, there have been more than 80 confirmed cases of enforced disappearances -- in other words murder -- since 1980. Only public and media attention and pressure to those horrible crimes by government will force the needed changes.